Two men who were trapped on the second floor of a burning townhome unit Saturday night — one of whom is confined to a wheelchair — were rescued by firefighters from the St. Charles Fire Department, Fire Chief Joe Schelstreet said Sunday. Firefighters responded at 11:47 p.m. to the 1700 block of Cumberland Green Drive in St. Charles, where they found “heavy fire conditions” and an older man confined to a wheelchair unable to get out of a bedroom, while his son was “hanging over the balcony” struggling for help, Schelstreet said. “Heavy smoke was pushing over him from the sliding glass doors — the father was still in the building,” Schelstreet said. Firefighters used a portable ladder to immediately rescue the men, he said. 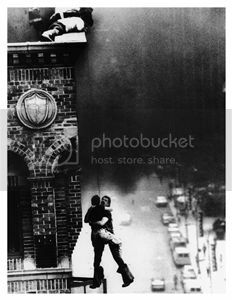 “A fireman accessed the balcony and carried the father down the ladder,” Schelstreet said. They then assisted the son out of the unit, he said. The father was taken to Delnor Hospital in Geneva, when he remained Sunday for observation, Schelstreet said. “He was able to speak when he was placed in the ambulance,” Schelstreet said. The son was evaluated by paramedics on the scene and declined to be taken to the hospital. He said the blaze was discovered by a resident of the residential complex who then called 911. Schelstreet said the fire started on the second floor and was contained to the bedroom level. Some of the building’s other residents already had evacuated, he said, and firemen put the fire out in about 30 minutes. There were no other injuries, and the cause remained under investigation. A neighbor two doors down in the same building was startled Sunday morning to see a blue tarp draped across the exterior of her neighbor’s unit. “I just hope everybody is OK. 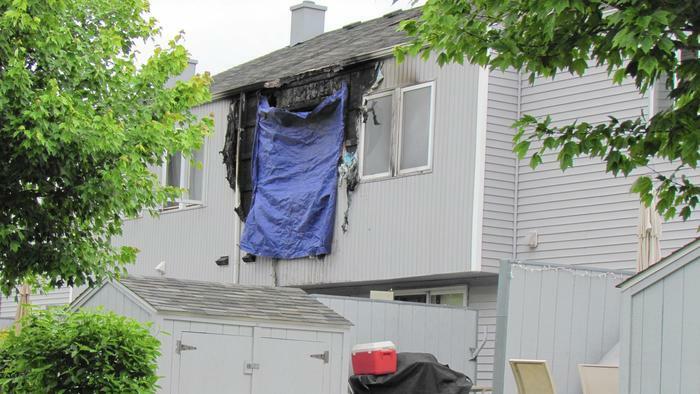 If someone was hanging over the balcony, the fire had to be pretty intense,” the neighbor said. The townhome is part of the Cumberland Green Cooperative, an affordable housing development and nonprofit owned by the residents, according to its website. The complex, north of Division Street and west of Kirk Road on the east side of St. Charles, includes about 25 buildings spanning two blocks, with eight units per building. The fire broke out in one of the buildings at the southern end. Another neighbor who lives in an adjacent building said he was asleep and didn’t hear the commotion of the rescue. “I don’t know too many of my neighbors. I am glad firemen got them out OK,” the man said. The townhome unit was destroyed, with damage estimated at $100,000, according to a release from the St. Charles Fire Department. Schelstreet said the management staff from the complex was working with tenants to make temporary housing arrangements. St. Charles firefighters were assisted by fire departments from Geneva, Batavia, West Chicago and South Elgin.